The first grievance involved temporary transfers. The contract read, "any employee transferred to a higher rated job will receive the higher rate of pay unless the transfer is brief and of an incidental nature." For the last twenty years employees always got the higher pay when they were transferred. A new boss had started routinely denying the extra pay on the grounds that he felt the work some employees did while on transfer didn’t deserve the higher pay. The second grievance was about discipline. Ralph was going to receive a one-day suspension for absenteeism. He had one of the worst absentee records of all the members but he was popular with a lot of people. He was demanding the union arbitrate his suspension. The third grievance concerned the Company denying an employee a temporary leave of absence. Phyllis had applied for an extra two weeks off so she could go on a cruise. The contract said the company would not unreasonably deny requests for leaves of absence but they could deny them for production or other reasons. The company had about a fifty-fifty record on allowing leaves. Marcy thought Phyllis’ foreman was being unreasonable but proving it would be another matter. 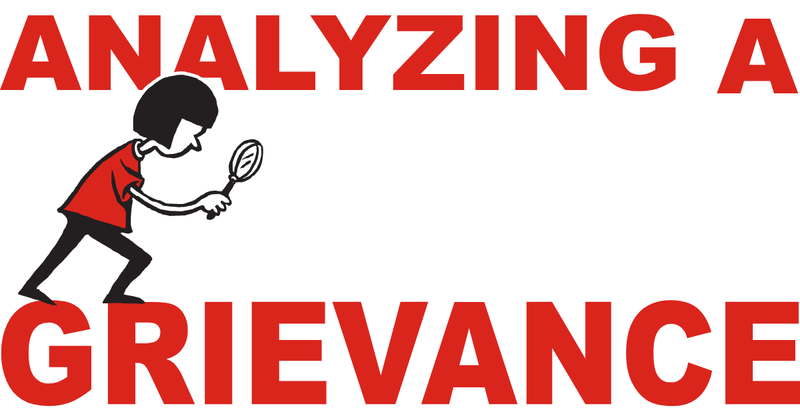 Analyzing a Grievance — How far do we go with it? Has there been a violation of the contract? Has the worker been treated unfairly and differently than other workers? Has there been a violation of established past practice? Has there been a violation of any Federal or State law? Has there been a violation of a previous grievance or arbitration settlement? Of course there can always be disagreement over interpretation but if the Union steward or worker feels the answer to any of the above questions is “yes,” then a grievance should be filed. The next question is how far does the union go with the grievance? Should the members be mobilized to fight for the grievance and if the employer still refuses to settle the issue, should the grievance go to arbitration? Lets look at the three grievances Marcy has. The first grievance concerns employees not getting a higher rate of pay when they are transferred to do work in a higher pay classification. The boss is citing the language that says employees don’t get the higher pay if the “transfer is brief and of an incidental nature.” However, Marcy’s investigation shows that the last five times the boss denied pay, employees had been transferred for the whole day. Past practice has been that employees get the higher pay every time they are transferred to the higher classification. While the amount of money involved is not great, this grievance could affect many employees in the future. Marcy decides to recommend going to arbitration if the employer doesn’t listen to reason. Since this affects everyone at one time or another, Marcy thinks the Committee and the Stewards should ask the members to demonstrate their support. The second grievance involves Ralph being suspended for excessive absenteeism. Marcy’s investigation indicates there are problems with this grievance. Ralph has one of the worst absentee records in the workplace. He’s a likable guy and his foreman has held off disciplining him. In fact there have been people in the past who were suspended with less time missed from work. He has received both a verbal and written warning in the recent period. After examining Ralph’s record, the practice concerning when people get suspended for missing work, and making sure that the employer has followed progressive discipline, Marcy thinks this one is a loser for sure. Ralph will have the opportunity to present his case at the membership meeting, but Marcy thinks the E-board should oppose going to arbitration over this issue. The final grievance concerns the employer denying Phyllis a leave of absence to go on a cruise. The employer was denying the leave based upon the fact that she would be gone during the last two weeks of what is normally a busy month. The record was fairly mixed about employees getting extra time off from work for vacations. There were a few cases that Marcy knew about when people were allowed time off during the busy months, but there were plenty of times when people were denied. A lot of the union members in Phyllis’ department felt the boss was mad at her for another grievance she had filed and won. Marcy felt that there was an injustice being done here, but proving the employer was violating the contract would be tough. If the union took this to arbitration and lost the employer would use it as an excuse to deny even more requests for leaves of absences. Since there was a lot of support in the department for Phyllis, Marcy thought she would talk to the Steward about getting a visible show of support for Phyllis, maybe a petition or stickers would do the trick. Who makes the decision on going to arbitration? It is the union that should make the decision on whether or not to take a case to arbitration, not just the individual involved. This is because the contract belongs to all the members, and the money spent on arbitration belongs to all the members. Often times there are issues involved that could hurt the members if an arbitrator rules against the union. This can make for difficult union meetings when a member feels he or she has been wronged but there is not a strong enough case for the union to be convinced it can win. It is difficult when an injustice has occurred but there is no contract language that addresses the situation. Stewards must remember that most contracts say that an arbitrator can only interpret the contract, not add to it. What if the employer wants to settle a grievance before it goes to arbitration? Often times an employer will settle a grievance after the Union has filed for arbitration; at times they even settle at the arbitration hearing. This may be because they weigh how much it will cost them, or perhaps the union has demonstrated how the members feel about this issue, or even in the rare case, cooler heads prevail. At this point it should be treated just like any other grievance. The Committee must weigh the settlement offer with the principles that are involved, and how the settlement offer stands up to the union possibly losing the arbitration. It is the Committee that has the right to decide on whether to settle or not. Too often, especially if the case involves a union member who was disciplined, the member will respond emotionally and not be thinking about the bigger picture and how the arbitrator’s decision will affect the entire membership. The member's feelings should be taken into account but in the final analysis it is the Committee that must decide.